Historical thinking is largely the ability to analyze causal relationships and to evaluate biases that influence the narratives handed down to us. An inference-based vocabulary is a toolkit to do this effectively. 1. Give students a vocabulary to analyze causal relationships and dissect the salient causes of historical events. 2. Create a protocol for historical inquiry that students can apply to any historical event or era. 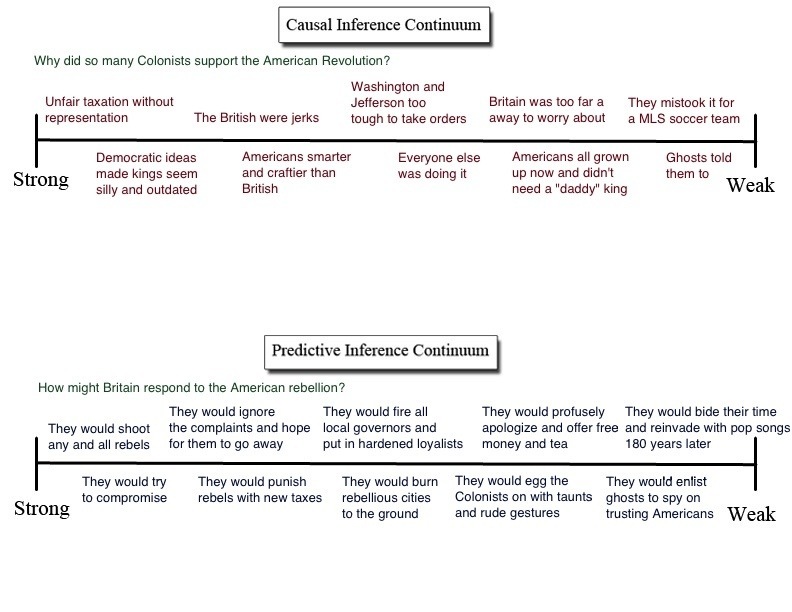 When searching for causal inferences, students will know to look for explanations and evidence in the following categories: 1. Government (power dynamics), 2. Economics, 3. Social Groups (including race and class divisions), 4. Geography, 5. Religion, and 6. History/Mythology (ideology and identity). See this document for a detailed list of guiding questions using these categories. 3. Encourage students to see historical events as enormously complex moments composed of the interplay of values, interests, and conflict. 4. Encourage students to evaluate sources and strengths of historical evidence when determining the strength of an inference. 5. Encourage students to see historical events through the eyes of contemporaries and appreciate the uncertainty involved, as history appears inevitable only in hindsight. An inference continuum can be used at three stages of the learning process (for an excellent overview of other strategies at each stage, see Vicki Jacob’s document). 1. 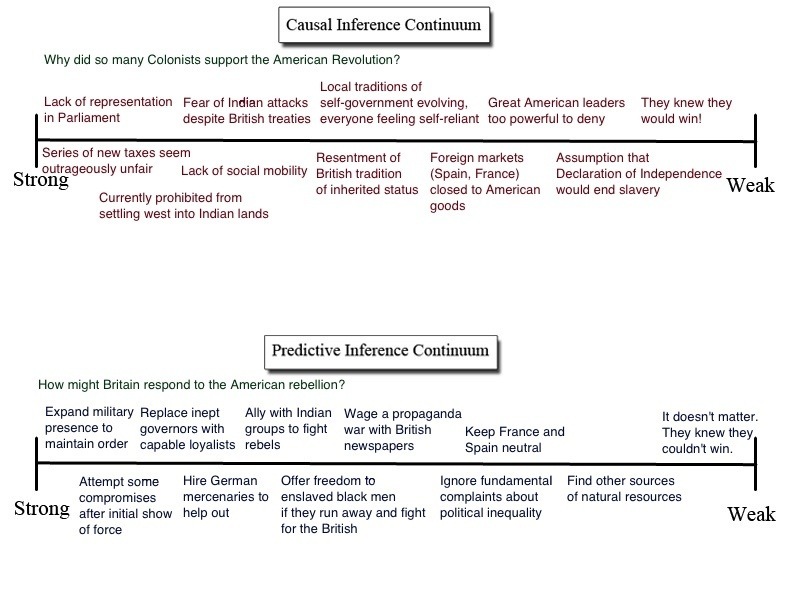 Pre– Students can use the inference continuum to activate prior knowledge and probe their sources of evidence, which for history is often pop culture cartoons and movies. 3. Post– Students can use the inference continuum to synthesize a large amount of information and archive information in a manner that is accessible and personally relevant. Students won’t have any new data to work with, so they will have to imagine possibilities. Ideally, this will build investment and curiosity into the topic at hand. The readings and lectures will have a greater sense of relevance if they have cleared the mental space (created the categories, asked the questions, made predictions, etc.) to receive the information. Students can return to their inference continuums as new information is provided, making additions and adjustments as needed (many of their previous strong inferences will likely slide down the continuum). At the end of a unit, their continuums will provide an excellent resource for studying, for essay topics and arguments, and as a crystallized picture of their knowledge and understanding. As students move on to new historical events and questions, the underlying skills taught by this model will serve them well. They will be trained to generate and evaluate multiple inferences, look for multiple causality, and analyze history through several lenses (the cultural categories). The more this model is used, the better these skills will be developed and internalized.